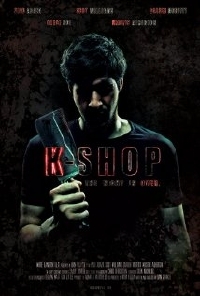 A gritty Sweeney Todd inspired thriller, K-SHOP is the story of a British kebab shop plagued by binge-drinking culture. After his father is killed in an altercation with drunken thugs, the filmâ€™s protagonist Salah (Ziad Abaza) finds himself struggling with the frenzied nightlife that descends upon the family kebab shop night after night. The situation reaches boiling point one night when a fight with an angry customer ends in grizzly circumstance. Salah is forced to dispose of the customerâ€™s dead body and looks to the one place he knows bestâ€¦ the kebabs. As Salah watches his gullible customers devour the new flesh kebabs, he eyes the opportunity to seek revenge on the world. The dark descent into vigilantism begins as he sets about killing others he deems punishable. â€˜When my producing partner Adam J Merrifield approached me to co-produce with him on this Sweeney Todd inspired thriller, I was completely bowled over after reading the script penned by Dan Pringle," said producer/actor Mem Ferda about the project. "I can only describe it as an intoxicating, super-slaughter, Sweeney Todd-esque ride that cleverly takes a stab at British binge drinking." Ferda went on to say, "It's high time a socially relevant film like this was made highlighting the significant problems of drink culture that is prevalent amongst our â€˜teenâ€™ society today. Albeit intelligently embodied in a wonderfully entertaining horror thriller. Dan Pringle clearly has the stamp of greatness, he is one of the most exciting of new British directors I have come to know." K-Shop stars Ziad Abaza, Scot Williams, Darren Morfitt, Reece Noi, and Kristin Atherton. It is written and directed by Dan Pringle.